VANCOUVER, CANADA / TheNewswire / April 23, 2018 - Sarama Resources Ltd. ("Sarama" or the "Company") (TSX-V:SWA) is pleased to announce that it has entered into a binding agreement for the sale of its non-core Kandiole Sud Exploration Property, West Mali (the "Property") (refer Figure 1) to Oklo Resources Limited ("Oklo", ASX:OKU) for consideration comprising cash and shares in Oklo for a total value of A$1M (the "Transaction"). Upon completion, the Transaction will rationalise Sarama's exploration portfolio and allow the Company to focus on its advanced exploration assets located in the Hounde and Banfora Belts in south-western Burkina Faso. The sale provides Sarama with funds to augment its recent C$4M capital raise and provides opportunity for further value accretion for the Company via exposure to Oklo's nearby exploration projects. - Transaction rationalises Sarama's operating jurisdictions, allowing the Company to focus its resources on Burkina Faso where it has had considerable exploration success in the Hounde Belt. - Augments Sarama's recent C$4M capital raise which will be used to advance the Company's exploration projects in Burkina Faso. - Brings value forward and provides opportunity for Sarama to derive further value from the transaction via exposure to Oklo's exploration projects in the West Mali region. - Oklo is well placed to advance exploration on the Property and control the development of the region given its dominant position, highlighting the potential for further value creation for Sarama. - Total consideration payable by Oklo of A$1M in a combination of cash and Oklo shares. "The divestment of Kandiole Sud property to Oklo Resources is a great outcome for both companies. While the property is well-located in West Mali and has untested exploration potential, Sarama's primary focus is Burkina Faso and the completion of this transaction allows us to direct our resources and capital toward our promising ThreeBee and Koumandara Projects. Oklo has established a strong presence in the West Mali region and is well-funded and positioned to undertake the exploration programs that the property warrants. Sarama looks forward to the evolution of this exploration story where it may derive further value through its interest in Oklo." The Transaction is agreed on the basis that Sarama's Malian subsidiary ("Sarama Mali") has earned a 100% ownership interest in the Property and agrees to sell such interest to Oklo (or its nominee). Completion of the Transaction will occur on the date ("Completion Date") that is two business days after the later of date on which the binding agreement has been executed by both Sarama Mali and Oklo or the date on which all of the Conditions Precedent (as defined below) have been satisfied. (c)any combination of (a) and (b) at Sarama's election to a combined total of A$200,000. 2.Tranche 2 Consideration, payable on the Completion Date, issue that number of Oklo Shares that is equal to A$500,000 divided by the 10-day volume weighted average price of the Oklo Shares for the period ended on the 20th April 2018. 3.Tranche 3 Consideration, payable 2 business days after the date on which Oklo or its nominee is registered by the Mali Ministry of Mines as the 100% owner of the Property, that number of Oklo Shares that is equal to A$300,000 divided by the 10-day volume weighted average price of the Oklo Shares for the period ended on the 20th April 2018. 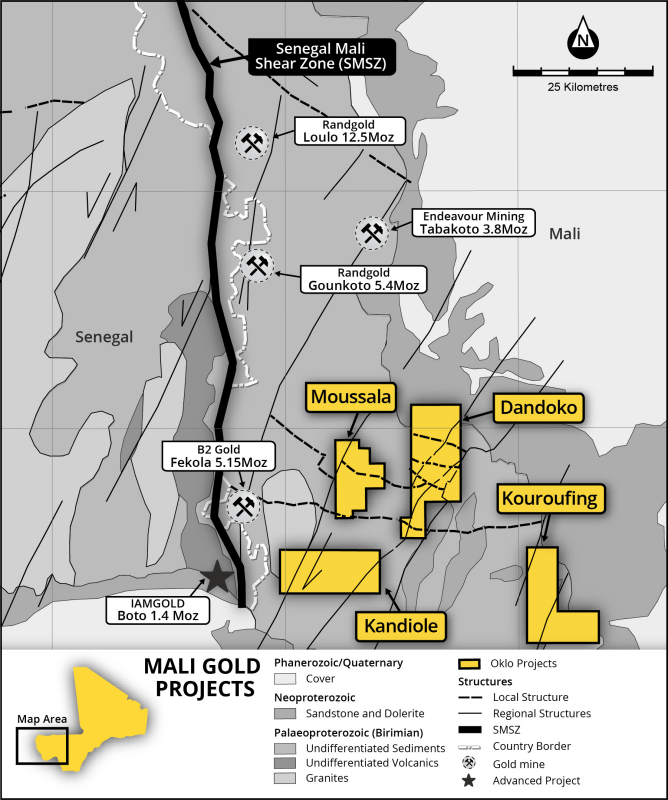 - the execution of an assignment agreement with Xinga Gold SARL pursuant to which Sarama Mali's interest in, and its rights, obligations and duties pursuant to, Sarama Mali's existing option agreement (as amended) shall be assigned to Oklo. Sarama Resources Ltd (TSX-V: SWA) is a West African focused gold explorer with substantial landholdings in Burkina Faso. Sarama is focused on consolidating under-explored landholdings in Burkina Faso and other established mining jurisdictions. Sarama's flagship properties are situated within the Company's South Hounde Project area in south-west Burkina Faso. Located within the prolific Hounde Greenstone Belt, Sarama's exploration programs have built on significant early success to deliver an inferred mineral resource estimate of 2.1Moz gold(2) Acacia Mining plc is earning up to a 70% interest in the South Hounde Project by satisfying certain conditions, including funding earn-in expenditures of up to US$14 million, over a 4-year earn-in period and may acquire an additional 5% interest, for an aggregate 75% interest in the Project, upon declaration of a minimum mineral reserve of 1.6 million ounces of gold. Acacia has satisfied certain milestones and currently holds a 50% interest in the South Hounde Project and is continuing to sole fund exploration activities. Sarama holds a 30% participating interest in the Karankasso Project Joint Venture ("JV") which is situated adjacent to the Company's South Hounde Project in Burkina Faso and is a JV between Sarama and Savary Gold Corp. ("Savary"). Savary is the operator of the JV and in October 2015, declared a maiden inferred mineral resource estimate of 671,000 ounces of contained gold(3) at the Karankasso Project JV. Sarama has also acquired a 100% interest in the Bondi Deposit from Orezone Gold Corporation (refer news release May 24, 2016). Bondi has a historical estimate of mineral resources of 0.3Moz Au (measured and indicated) and 0.1Moz Au (inferred)(1). Together, the South Hounde Project, Bondi Deposit and the Karankasso Project form a cluster of advanced gold deposits, within trucking distance of one another, which potentially offers a development option for a multi-source fed central processing facility in the southern Hounde Belt region of Burkina Faso. Sarama had recently established a new 600km2 exploration position in the highly prospective Banfora Belt in south-western Burkina Faso. The Koumandara Project hosts several regional-scale structural features and trends of gold-in-soil anomalism extending for over 40km along strike. 1.Bondi Deposit - 4.1Mt @ 2.1g/t Au for 282,000oz Au (measured and indicated) and 2.5Mt @ 1.8g/t Au for 149,700oz Au (inferred), reported at a 0.5 g/t Au cut-off. i.The historical estimate of the Bondi Deposit reflects a mineral resource estimate compiled by Orezone Gold Corporation ("Orezone") which has an effective date of February 20, 2009. The historical estimate is contained in a technical report titled "Technical Report on the Mineral Resource of the Bondigui Gold Project", dated date of February 20, 2009 (the "Bondi Technical Report") and is available under the profile of Orezone on SEDAR at www.sedar.com. ii.Sarama believes that the historical estimate is relevant to investors' understanding of the property, as it reflects the most recent technical work undertaken in respect of the Bondi Deposit. iii.The historical estimate was informed by 886 drillholes, assayed for gold by cyanidation methods, were used to interpret mineralised envelopes and geological zones over the area of the historical estimate. Gold grade interpolation was undertaken using ID2 methodology based on input parameters derived from geostatistical and geological analyses assessments. Field measurements and geological logging of drillholes were used to determine weathering boundaries and bulk densities for modelled blocks. iv.The historical estimate uses the mineral resource reporting categories required under National Instrument 43-101.
v.No more recent estimates of the mineral resource or other data are available. vi.Sarama is currently undertaking the necessary verification work in the field and on the desktop that may support the future reclassification of the historical estimate to a mineral resource. vii.A qualified person engaged by Sarama has not undertaken sufficient work to verify the historical estimate as a current mineral resource and Sarama is therefore not treating the historical estimate as a current mineral resource. 2.South Hounde Project - 43.0Mt @ 1.5g/t Au (reported above cut-off grades ranging 0.3-2.2g/t Au, reflecting the mining methods and processing flowsheets assumed to assess the likelihood of the inferred mineral resources having reasonable prospects for eventual economic extraction). The effective date of the Company's inferred mineral resource estimate is February 4, 2016. For further information regarding the mineral resource estimate please refer to the technical report titled "NI 43-101 Independent Technical Report South Hounde Project Update, Bougouriba and Ioba Provinces, Burkina Faso", dated March 31, 2016. The technical report is available under Sarama Resources Ltd.'s profile on SEDAR at www.sedar.com. 3.Karankasso Project - 9.2Mt @ 2.3g/t Au (at a 0.5g/t Au cut-off). The effective date of the Karankasso Project JV mineral resource estimate is October 7, 2015. For further information regarding the mineral resource estimate please refer to the technical report titled "Technical Report and Resource Estimate on the Karankasso Project, Burkina Faso", dated October 7, 2015. The technical report is available under Savary Gold Corp's profile on SEDAR at www.sedar.com. Sarama has not independently verified Savary's mineral resource estimate and takes no responsibility for its accuracy. Savary is the operator of the Karankasso Project JV and Sarama is relying on their Qualified Persons' assurance of the validity of the mineral resource estimate. 4.The ThreeBee Project comprises the Djarkadougou, Botoro, Bamako and Bouni Properties and Sarama has, or is entitled to have, a 100% interest in each of the properties. 5.For further information regarding the drilling on the Bamako and Bouni Properties, please refer to the technical report titled "NI 43-101 Independent Technical Report South Hounde Project Update, Bougouriba and Ioba Provinces, Burkina Faso", dated October 28, 2013. The technical report is available under Sarama Resources Ltd.'s profile on SEDAR at www.sedar.com. Information in this disclosure that is not a statement of historical fact constitutes forward-looking information. Such forward-looking information includes statements regarding the Company's ability to complete the Kandiole Sud Transaction, the value of the share-based consideration received by Sarama over time, the potential for further value creation through exposure to Oklo's shares, plans for exploration at the ThreeBee and Koumandara Projects, drilling and geochemical and geophysical surveys at the South Hounde Project, the Earn-In Agreement with Acacia, including the amounts that may be spent on exploration and interests in the South Hounde Project that may be earned by Acacia upon making certain expenditures and estimating a minimum reserve, the potential to expand the present oxide component of the Company's existing estimated mineral resources, and future exploration plans. Scientific or technical information in this news release that relates to the Company's exploration activities in Burkina Faso is based on information compiled or approved by Guy Scherrer. Guy Scherrer is an employee of Sarama Resources Ltd and is a member in good standing of the Ordre des Geologues du Quebec and has sufficient experience which is relevant to the commodity, style of mineralisation under consideration and activity which he is undertaking to qualify as a Qualified Person under National Instrument 43-101. Guy Scherrer consents to the inclusion in this report of the information, in the form and context in which it appears. Scientific or technical information in this news release that relates to the preparation of the South Hounde Project mineral resource estimate is based on information compiled or approved by Adrian Shepherd. Adrian Shepherd is an employee of Cube Consulting Pty Ltd and is considered to be independent of Sarama Resources Ltd. Adrian Shepherd is a Chartered Professional Member in good standing of the Australasian Institute of Mining and Metallurgy and has sufficient experience which is relevant to the commodity, style of mineralisation under consideration and activity which he is undertaking to qualify as a Qualified Person under National Instrument 43-101. Adrian Shepherd consents to the inclusion in this news release of the information, in the form and context in which it appears. Scientific or technical information in this news release, in respect of the Bondi Deposit relating to mineral resource and exploration information drawn from the Technical Report prepared for Orezone on that deposit has been approved by Guy Scherrer. Guy Scherrer is an employee of Sarama Resources Ltd and is a member in good standing of the Ordre des Geologues du Quebec and has sufficient experience which is relevant to the commodity, style of mineralisation under consideration and activity which he is undertaking to qualify as a Qualified Person under National Instrument 43-101. Guy Scherrer consents to the inclusion in this report of the information, in the form and context in which it appears. Scientific or technical information in this news release that relates to the preparation of the Karankasso Project's mineral resource estimate is based on information compiled or approved by Eugene Puritch and Antoine Yassa. Eugene Puritch and Antoine Yassa are employees of P&E Mining Consultants Inc. and are considered to be independent of Savary Gold Corp. and Sarama Resources Ltd. Antoine Yassa is a member in good standing of the Ordre des Geologues du Quebec and Eugene Puritch is a member in good standing of Professional Engineers Ontario. Eugene Puritch and Antoine Yassa have sufficient experience which is relevant to the commodity, style of mineralisation under consideration and activity which they are undertaking to qualify as a Qualified Person under National Instrument 43-101. Eugene Puritch and Antoine Yassa consent to the inclusion in this news release of the information, in the form and context in which it appears. Sarama has not independently verified Savary's mineral resource estimate and takes no responsibility for its accuracy.